This program has been designed to meet the challenging standards of a professional career in the beauty& entertainment industry. Program covers the theory, art & skills of make-up application for fashion, editorial, black and white photography, stage, film, TV and more! Students have the chance to learn different techniques through demonstration & hands-on instruction and train in a studio classroom space equipped with key lighting, mirrors, chairs needed for learning. The beauty & esthetics field training provides students with the techniques & knowledge to enter a growing and exciting industry. Through a well balanced combination of demonstration, theory & in-class practical work, students are prepared to work & provide professional services for modern salons; weddings & spas. They may decide to work for themselves and own their own business! Business, budgeting and marketing your own business essentials are also covered in this Certificate. Students will also be encouraged to begin preparing their own make-up kits and will be instructed on how to do so throughout the course. The Beauty Makeup Artistry Program is a well-designed course to prepare the students with the needed knowledge and skills for an exciting and competitive career as a professional makeup artist. · Contouring and much more. · Building portfolio/business cards/Self marketing. · Acquire the necessary skills and techniques students will get to use in makeup industry. 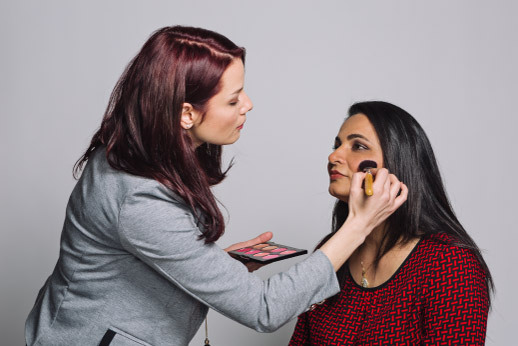 · Professional Training that helps them find a suitable job in this industry where students will be able to use the makeup skills they have learned? · There is also a choice for students to build their own business using the knowledge acquired in the course.